Melly and Coral are FINALLY back from Brazil! I know I should be happy, but I was a little mad too. 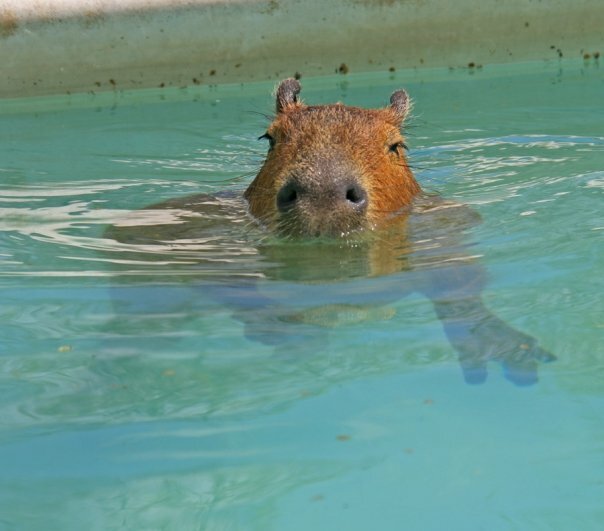 How could they go off and leave me just to see wild capybaras? 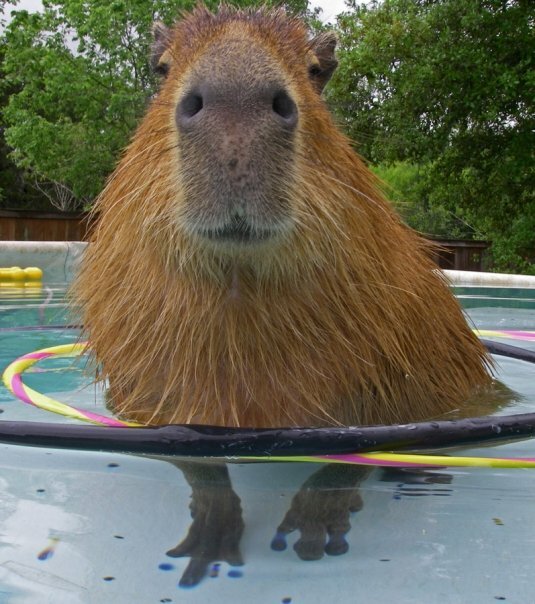 Am I not better than any wild capy? Do they not love me more? And the whole time they were gone, no one went swimming with me! 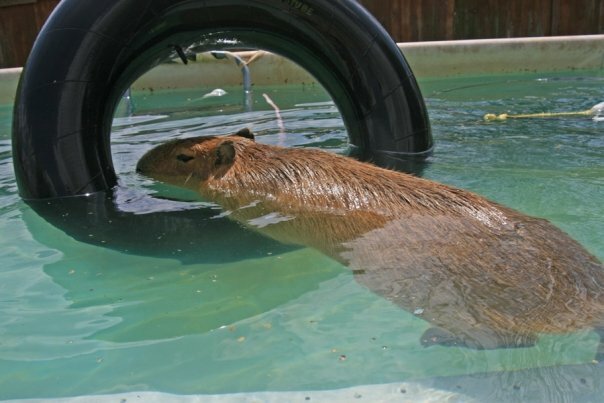 Sure, my Rick kept me company in the pool but not for very long and he only leans over the side, he never comes in the water. Pool treats! I missed them! Okay, I can be won over by pool treats. 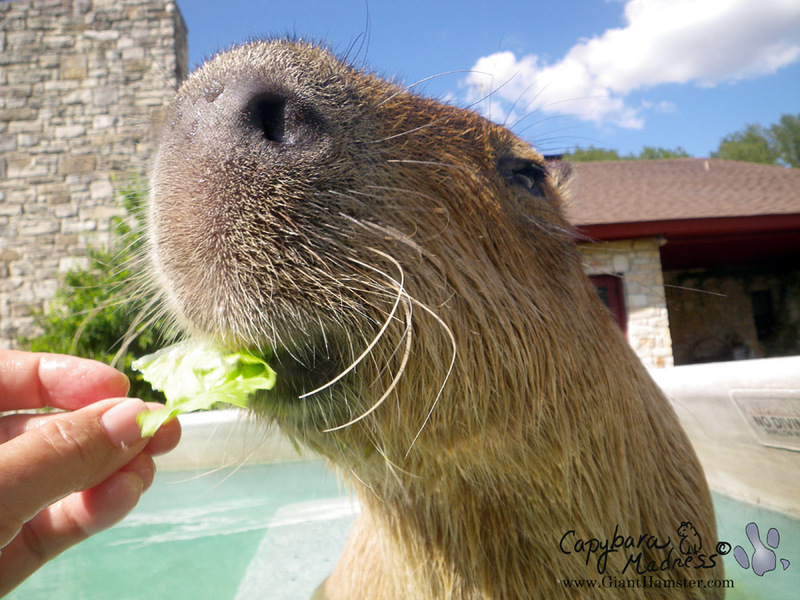 I had almost forgotten that Melly always feeds me a whole head of some leafy vegetable when she gets in the pool with me. That is hard to resist. This time it was romaine lettuce, one of my favorites. 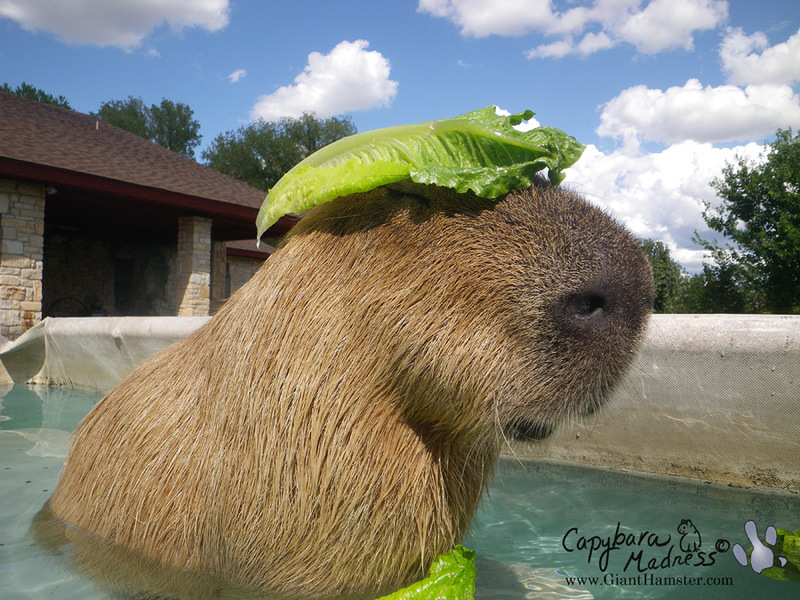 Lettuce is supposed to go in my MOUTH not on my HEAD! I had forgotten that Melly has a warped sense of humor. Why does she do these things to me? With one hand, a nice crunchy leaf goes into my mouth, with the other she plops a leaf down on my ears like a sombrero. I don’t think they even wear sombreros in Brazil. And what is this supposed to be? A sideways sombrero? A French beret? A banana leaf? I missed Melly but I did not miss this. 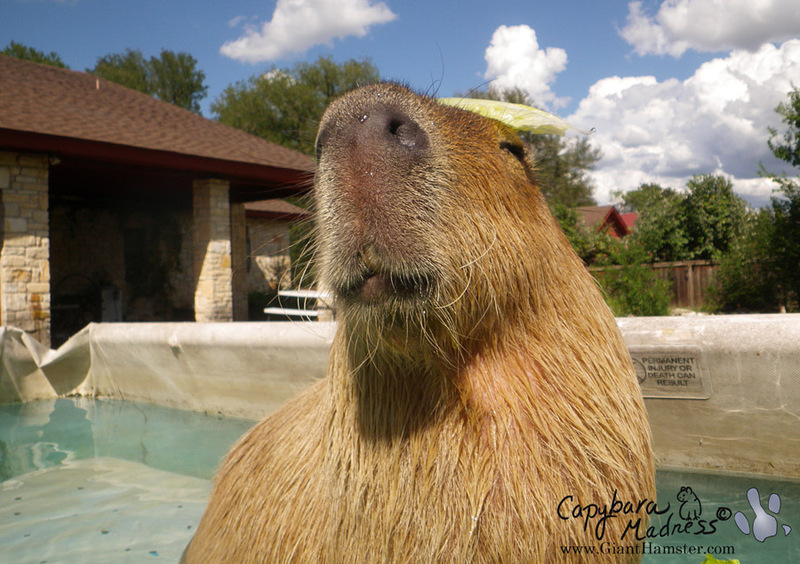 A capybara’s got to have a little respect, doesn’t he? At least in his own pool? I refused to pose for any more photos with lettuce on my head. At any rate, I ate all of the lettuce so it was time to make peace with Melly. 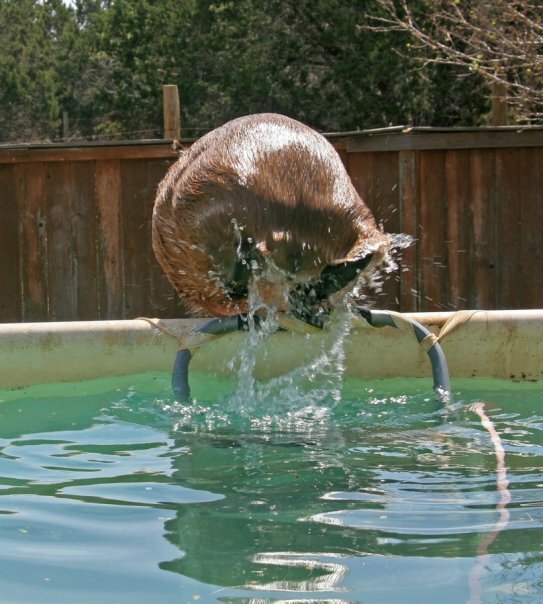 Melly also helps me practice my spins and rolls in the pool. 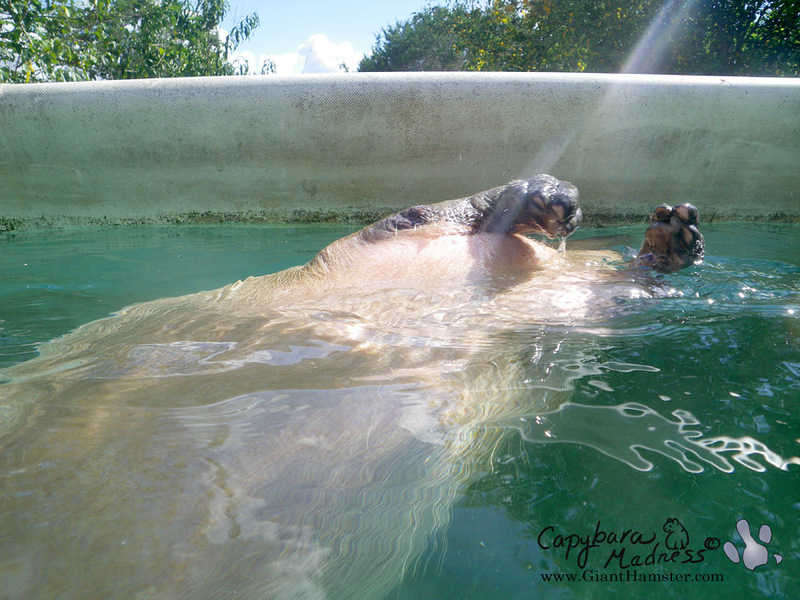 Those are my two front paws sticking out of the water. You can just see my chin between them. Don’t we look cute together? 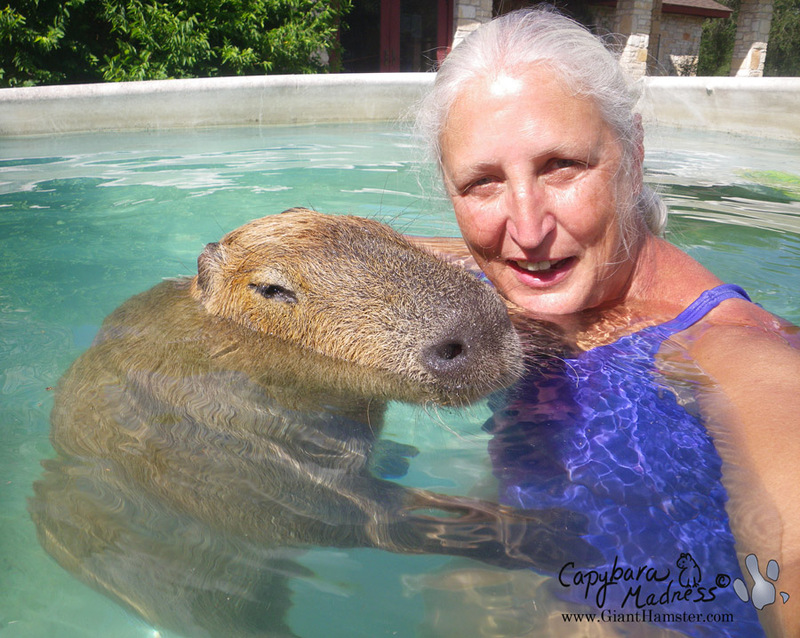 Melly says it is hard to take a “selfie” with a capybara in a pool. Coral came over too. 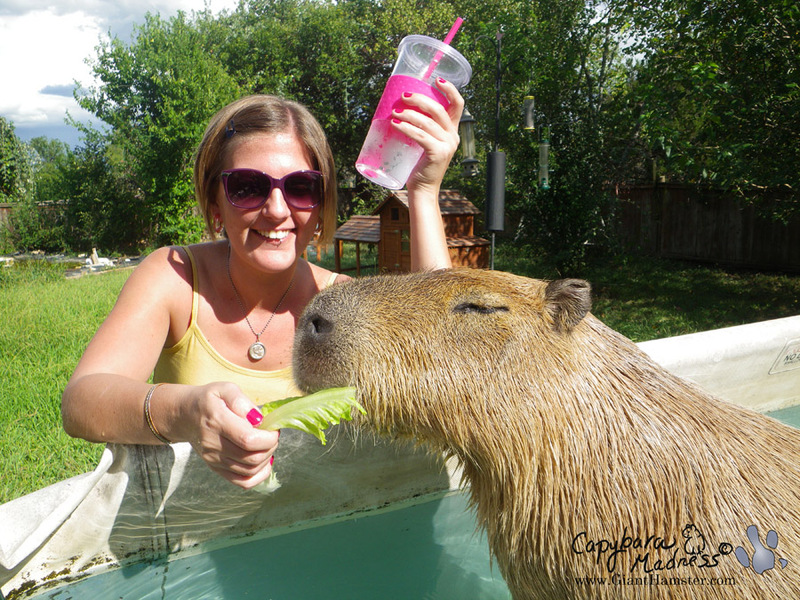 She didn’t get in the pool with me but she did feed me another big loaf of lettuce. I can almost forgive Melly and Coral for going off to Brazil except for one thing, they both say they want to go back! NO! NO! NO! They cannot go back because I do not want to go and they are not allowed to leave me ever again! 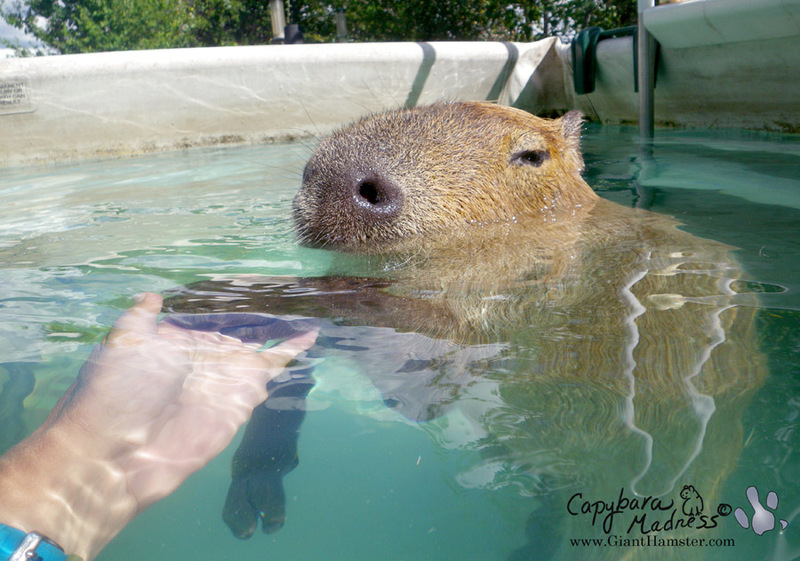 Who needs wild capys when you have me right here! It makes no sense at all! 11 comments to They’re Back! Gari, at least Melly gets in the pool with you! I think it is because your water is WARM, my pool water rarely gets above 65 degrees. 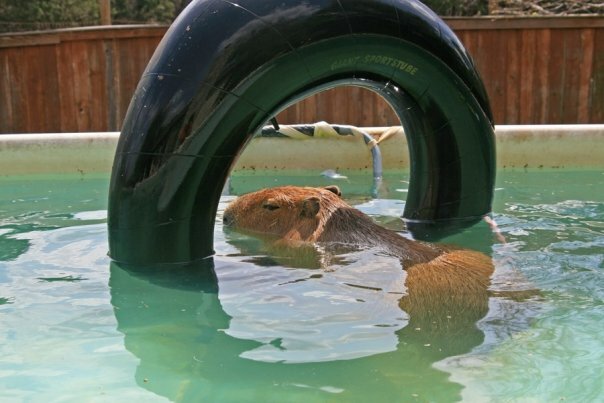 Plus, I never get lettuce in the pool, only bits of leftover watercress the goldfish don’t eat. 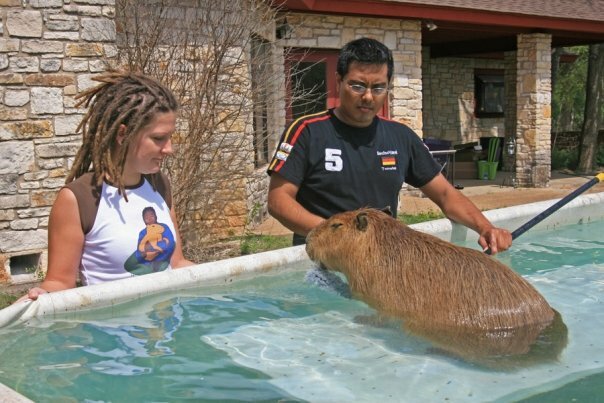 Stacy and Sam are talking about going back to Brazil, too, though in their case I don’t think it has anything to do with wild capybaras. They just like Brazil. 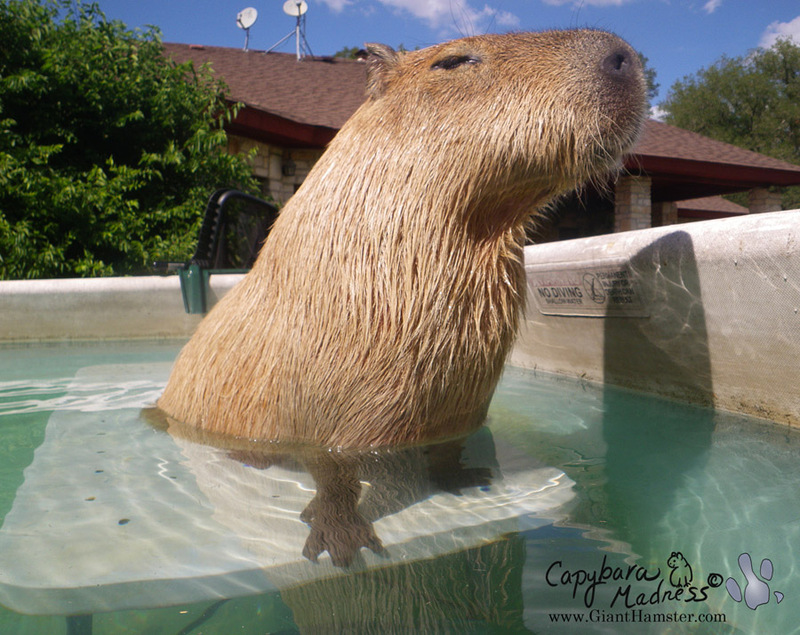 Gari they only went to Brazil becausde they felt BAD for the other capys because they will never live up to your ultimate capy grandeur. they gave them a little pity love! Glad that Melly & Coral are back where they belong. I’m sure the wild cappys just made them appreciate you more. I’m envious that Melly gets to swim with you, that must be so fun to share the pool with you.I bet she wishes she could do rolls like that. The lettuce leaf looks like a beret & quite jaunty, actually. No need to be embarrassed. Great to see you back blogging, of course with Melly’s help. No matter what you have on your head you look FANTASTIC. Royal Gari that is for sure. Drag Rick into the pool next time, you got the strength mate. But be sure to drag him out too after having fun. See Gari, you admitted that you missed Melly. 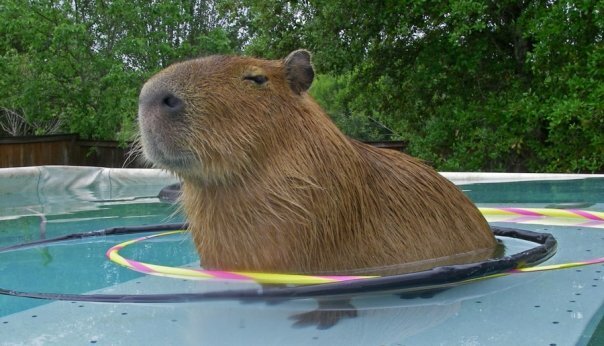 So I wasn’t putting words in your little Capy mouth. I’m sure she thought about you alot when she was away. 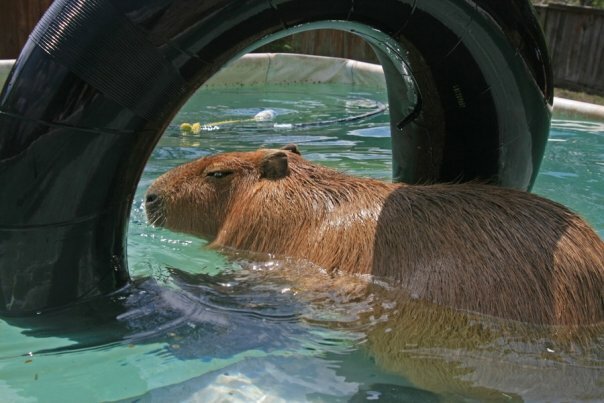 There is no Capy in Brazil that can come close to being a Gari. So you never ever have to worry your cute little head over that. You are so loved my dear. Never forget that! 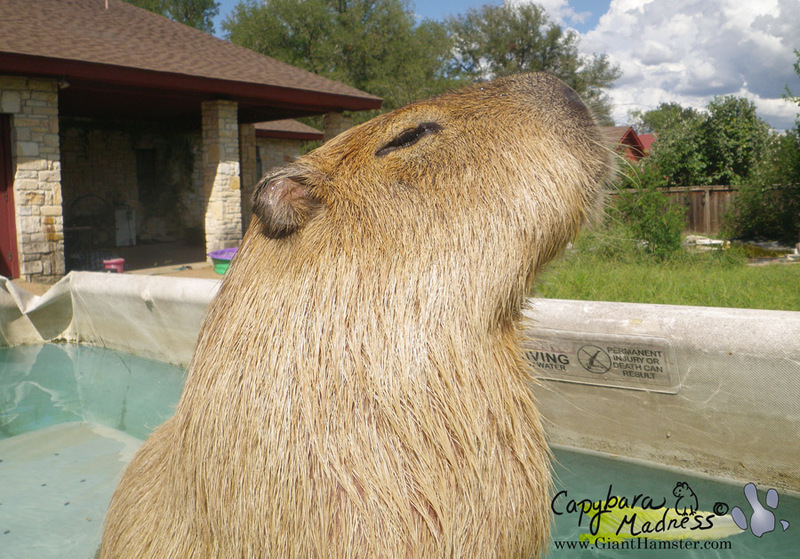 I’m sure Melly missed you very much Gari, After all, you are the best capy around!